Rewrite the story of your intranet. Your intranet doesn't have to be outdated, cluttered, and difficult to manage. IntranetPro helps people do their jobs better, and it makes you look like a hero. Ready to learn why IntranetPro is the best choice? Employees will avoid a clunky, outdated intranet. Modernize your intranet so that people will use it and it won't go to waste. IntranetPro is more modern and useful than our previous intranet. It's like going from a bike to a sports car! No one wants to sift endlessly through a cluttered intranet. Find what you're looking for in seconds. Search smarter, not harder. I can easily access things that were so hard to find on our previous intranet. IntranetPro saves me tons of time! It's hard to maintain an intranet that's difficult to update. Manage your intranet with ease using a tool designed to empower you. IntranetPro is really, really easy to use. I love how quick and simple it is to add articles and manage content. Starting from scratch with a custom SharePoint intranet can take more than a year to finish. By the time it launches, your needs will likely have changed. Building a custom solution from the ground up requires ample resources and effort. Starting at square one costs more than beginning with a framework. Creating a custom intranet increases the probability of mistakes and unnecessary error. Why reinvent the wheel when there is a platform proven to work? Other intranet platforms focus on delivering a checklist of features. The user's best interest isn't top of mind, which leads to low user adoption. Other platforms may not be hard to navigate, but they're still a pain to manage. If it still requires technical knowledge to update, it's not your best option. They may look and feel a little different, but most other platforms still look a lot like SharePoint. If you want an intranet that users will enjoy using, look elsewhere. Intranet platforms that are not built on SharePoint have limited functionality. Many organizations who choose a non-SharePoint discover this too late. Using a non-SharePoint intranet platform can become messy and disorganized. Employees switch between various tools that don't all connect well with the intranet. Most non-SharePoint intranet platforms only offer per-user pricing. As your organization grows, your intranet becomes significantly more expensive to maintain. Get a full-blown enterprise intranet up in running before next quarter. IntranetPro shortens your time to launch, so you can start using it sooner. Save money, but don't sacrifice quality. 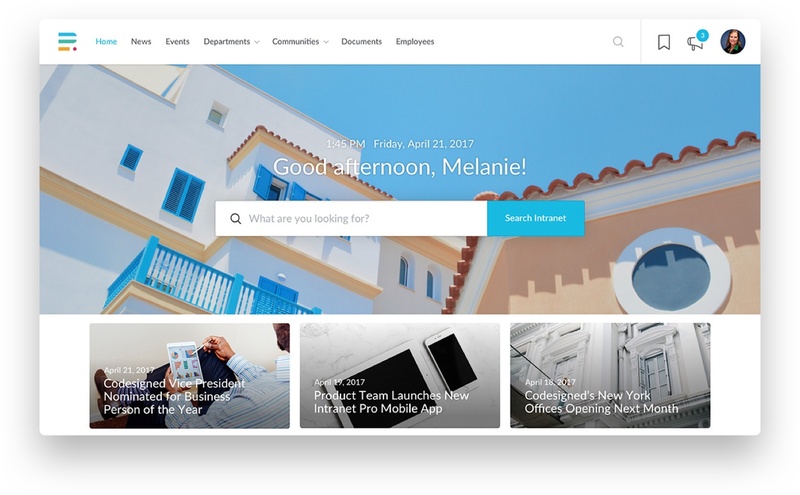 IntranetPro has everything you would expect from an enterprise intranet, minus the high price tag. Avoid opportunities for error by choosing a polished platform. IntranetPro is already designed and developed, so there are fewer chances for mistakes. An intranet designed for people will be more successful in the long run. We created IntranetPro to help the people using it achieve their goals. IntranetPro is more than just a pretty interface. It helps you manage your intranet without needing technical skills. Plus, it has built-in analytics. Employees are more likely to engage with an intranet that's visually appealing. Our design team crafted IntranetPro with care, so people would want to use it. SharePoint is the most popular enterprise intranet software. IntranetPro is built on a powerful platform that has been the leader in intranets for years. A SharePoint intranet doesn't just integrate with your other business tools. IntranetPro enhances your use of them by creating a smooth, unified experience. IntranetPro doesn't structure pricing on a per-user basis. You can choose what's best for your organization with our different pricing options. Learn more here.